Manager Danny Lennon insists St Mirren were never going to settle for a point once they had pulled themselves level against Motherwell. 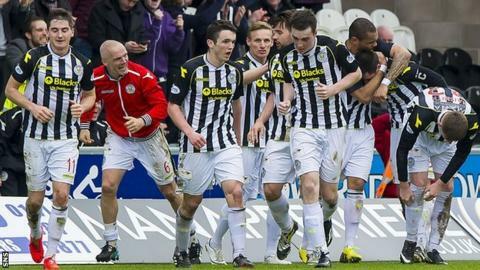 Kenny McLean's equaliser from the spot was followed by Steven Thompson's strike to give the Buddies a 3-2 win. "As they were celebrating, big Stevie was closest to me and I said we've got to go for the jugular," said Lennon. "We've got to make sure we pick up the maximum points because it's incredibly tight at that bottom end of the table." St Mirren have moved into 10th place in the Premiership and their victory also confirmed Hearts' relegation from the top flight. We spoke to the players about six sprints to the end of the season and that is one that we came through together. Saints and the other teams in the bottom six are now trying to avoid the 11th-place relegation play-off spot. "I think it will go right to the wire," Lennon told BBC Radio Scotland. "We've found ourselves at the bottom and we've managed to keep in with a pack of runners and it's a sprint now to get over that finishing line. "We spoke to the players about six sprints to the end of the season and that is one that we came through together." Motherwell threw away a 2-0 lead, given to them by Henri Anier and former St Mirren striker John Sutton. Even when Thompson pulled it back to 2-1, Stuart McCall's men looked relatively comfortable before St Mirren's late show.